Especially in Xinjiang, construction is rampant. Villages that one guidebook (from 2002) said were "good places to see traditional Uighur culture" and another (from 2010) said was "beginning to become another Chinese city" were very much in urban development when I went to see them. The Han locals that I spoke to supported it, for the most part. One woman I met in Ruoqiang said with pride, "yes, there is much construction. This is a developing city!" During my time in the province, the most common job of the Han people that I met was "construction engineer." They all told me that Xinjiang was the place to come once they graduated because if the push for development. Mao's encouragement for the eastern Han people to move in and help develop the Uighurs is still very much present here. Most of the travelers whom I met were very opposed to the "destruction" of Uighur culture, as were some Uighur people. However, I also got a sense that the economic and educational benefits that come with China-fication were very much appreciated. Despite the sometimes quirky or seemingly oppressive laws that they are required to enforce, most of the individual police officers or military personnel whom I met in China were very friendly. Not only that, but they were always quite professional, too. They took care of their uniform and appearance, they did their jobs dutifully, and I never once was asked to pay any bribe or other "fee". 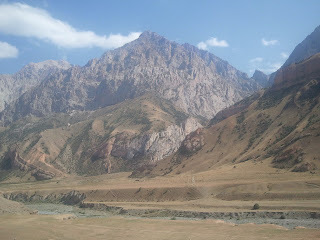 As soon as I entered Kyrgyzstan, however, the difference was very apparent. The first two Kyrgyz border guards that I met were sitting on a rock on the side of the road, shirts untucked, eating sunflower seeds with their backs to the trucks waiting to cross through their gate. Once approached, they passively flipped through my passport, examined the Chinese visa only (not any of the information that might be pertinent to their jobs), and let us pass. Within hours of being in Bishkek, I heard two seperate stories of travelers being hassled by police or fake police for bribes or passports. A threat to call the embassy seems to be enough to get them to back off, luckily. Those are two real people who lived 1000s of years ago. Crazy, right? Ever think mummies were just for Egypt? WRONG! it turns out Xinjiang is almost entirely desert, and when you bury a body in the desert, it just sits there. For a very long time. Almost every town had a museum and each museum had a collection of mummies from the area. This one in particular had a dozen, including 3 infants. Interestingly, most of the mummies are light-skinned, tattooed central asians, not east-asian. 4. EVERY town has a central square. 5. English isn't a strong suit. What do you mean when you say "carrots" and "basket"...? Is that TP? Yes. A good reminder while I pee in the nasty, nasty, uncleaned urinal hole. 1. The food from Mongolia to here is basically the same, but becomes more flavorful! Below is an example of meat in a pocket of bread. In Mongolia, it had various names, but basically consisted only of boiled mutton and bread. In Xinjiang, it was known as cao bao zi and had a little bit of spice added in with the mutton. Here in Kyrgyzstan, it's called samsa and is super flavorful. It's still mutton and mutton fat, but they add in onions and probably a good handful of spices to keep things interesting. I love street food. Plov. it's fun to say, right? Plov plov plov. 2. Even though you're in the high mountains, you should still be careful about drinking the water. I've given stool samples in the states before (last time I came back from traveling, actually). There, you have a little tupperware bin that you can seal up and pass to the lab techs. In Kashgar, you go in a small cup that seems to have less structural integrity than a Costco sample cup, then you walk across the building, down a flight of stairs, through a crowded waiting room and hand the open cup to a lab tech, who examines it immediately under a microscope to tell you that he can't find anything interesting. On the plus side, the half-day at the hospital only cost me about $2.50. Everywhere I've been in Central Asia I've met tons of super friendly and welcoming people. Couchsurfers and others have put me up for a night or several, I've been given meals and free rides. One of the drivers that picked me up actually tried to pay ME 50 yuan (~$8) for food after he dropped me off. I tried it on a whim in China and it worked quite well. Research about Central Asia, however, told me that it would be very difficult and most people would want money. 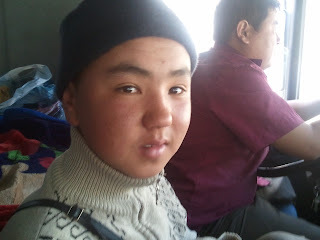 I met one traveler who came from Kyrgyzstan and had been successful, however, so that was enough for me to give it a try. My experience thus far: not bad at all! It usually takes a few tries before someone will actually pick you up. They still aren't quite used to the idea here in Kyrgyzstan. Most people will just try to direct you to the nearest taxi stand instead. Once you make it clear that you just want to get somewhere in the direction of where you're headed and that you're not going to be paying money, though, some people will happily take you. Trucks tend to be the best option, as they're already getting paid and are probably pretty bored from days of driving anywhere. If you're not in a rush, have time to spare and don't mind super awkward attempts at Russian conversation followed by hours of silence and hand guestures, it's great! Fro truck. He didn't give me a ride. When your tire blows out, just swap it for one of the others! Who needs a spare when you have 18 wheels? Roma and I waited for about 2hrs in this town before we got a ride. 5. Politics are a mess. Borders make a big difference, despite ethnic ties. Central Asia has a fascinating history. So many different peoples have lived in these lands over the millenia that it has become very difficult for anyone to say who was "here first". As a result, when lines are drawn on a map they become a good excuse for nationalism. Stalin drew some lines back in the '30s that are causing loads of issues in this region today (take a look at a map of the 'stans to get an idea). The bustling metropolis of Irkeshtam, Kyrgyz border town. 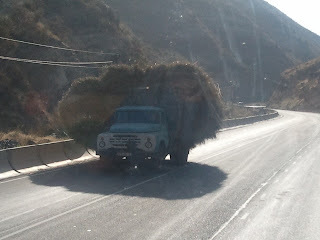 Basically a trailer park/truck stop in teh mountains. 6. Learning another language is hard. Russian is really hard. Chinese is even harder. Mongolian/Kazakh/Uighur/Kyrgyz/Tajik/Uzbek/Chinese/Russian all at the same time makes you want to go to Central America with a spanish phrasebook. I gave up on learning more than a few phrases in Chinese. I'm going to start taking Russian language classes for a short time while I wait for visas here in Bishkek. Wish me luck. So far I feel like I've only been able to experience a certain amount from my travels. Watching someone like Roma, my Russian hitchhiking buddy, be able to have a full conversation with our drivers or other locals, made me realize that by learning a bit more of the language I will have more opportunities to get a feel for what life is really like for the people whose homeland I'm visiting. Harry's Russian twin, "Garry" Potter. He must go to Durmstrang. 7. It's very mountainous. And beautiful. And sparsely vegetated. you could see the bottom of this lake through tens of meters of water. great update with human and landscape accounts. i am learning how ho hum my own landscape is here. they certainly got the right guy to go for a hitchike.